BILLY: Well here we are Lauren! The red carpet at the February 2008 Daring Bakers’ Challenge! The bakers are arriving as we speak, brandishing their baguettes, batards, boules and other French bread forms in the air! LAUREN: I’m sure Joan will have lots to say about these various shapes tomorrow in the fashion rundown. This is very exciting! 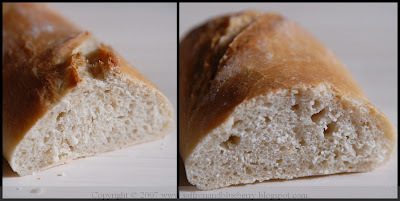 Some of these breads have sandwich fixings or various types of cheeses accompanying them. How do you think the Bakers decided what to pair with their bread, Billy? BILLY: I don’t know Lauren, let’s grab one of these guys or gals and ask them what went into their choices! Pulls random Daring Baker out of the crowd. Unfortunately , she’s looking a little dishevelled and not quite as nice as the batards she’s holding in her arms. She doesn’t appear to have any accompaniments to her bread either. But they have to shove someone in front of the camera so they go with it. BILLY: Hello! Nice to see you here with us! Tell us who you are and what you made! HILDA: Uh..Hi, I’m Hilda and I chose to make the three batards out of the options available to us this month. LAUREN: A lot of the other bakers seem to have foods to accompany their breads but you don’t, do you want to tell us about that? HILDA: Well...I made these at the very last minute, the 11th hour, as it were, so I didn’t really have time to think about what to accompany them with. But my boyfriend suggested we slice them up, dry them in the oven and make bruschettas out of them. So that’s probably what we’ll do when I get home from here. BILLY (without the slightest hint of sincerity): That sounds fantastic!! I’d love to get my hands on some of those! Can I go home with you?! Hilda gives him a strange look right around then and he hands the questioning over to Lauren. 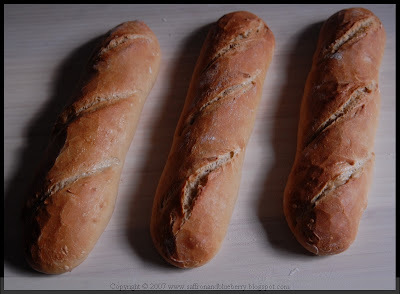 LAUREN: Tell us Hilda, what goes into the making of Julia Child’s French Bread? HILDA: Well, I could give you the fourteen page recipe, or do you want me to give you a rough breakdown of what I did? LAUREN: Fourteen pages! Oh dear! Why don’t you just tell us what you did. HILDA: OK, you mix the flour, yeast, water and salt together, which was pretty simple, except I think there’s a little too much salt in this recipe, and probably because mine didn’t puff up a lot, the taste of yeast was very present too. I probably did something wrong though. And then I’m not sure if I added too little or too much flour to get it to the right consistency before letting it rise. The first rise went fine but you know how when you get dough out of a recipient, you can have that moment where you’re not sure if the dough is still too sticky and maybe you did something wrong and should have added more flour? Lauren stares back at her blankly. No, she hasn’t had that moment. Hilda stares back and decides to go on. LAUREN (interrupting): --850 times! Did you knead this bread 850 times?! HILDA: Yes Lauren, I did. I kneaded this bread 850 TIMES. 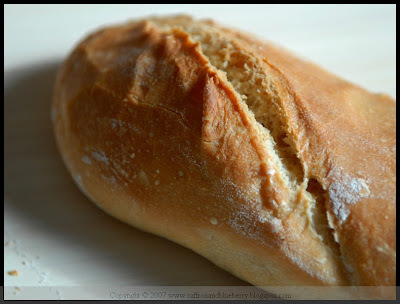 Let me say that again for all the viewers out there, I KNEADED THIS BREAD 850 TIMES. LAUREN: You must have thought your arms were going to fall off. HILDA: Yes, as a matter of fact, I did think my arms were going to fall off when I KNEADED THIS BREAD 850 TIMES. But on the other hand, I figured if the bread ended up failing completely, I wouldn’t be able to think it was because I hadn’t kneaded it 850 times, because... I did...KNEAD IT 850 TIMES. Anyway, I watched the videos for the shaping too and that went pretty well, and then I let them rise under a cloth, but before I shaped them I think I let the dough rise too long the second time because of the disaster. HILDA: Yes, see we just moved into a new house with really old crummy appliances, so the kitchen’s being entirely redone, so I was cooking in the house we were in temporarily while we were waiting to move into the new one, and I realized that the oven wasn’t heating up beyond 340°F and you need to cook the bread at 450°F. And this is in the middle of the night because I started my bread so late in the day. LAUREN: What did you do? HILDA: I panicked. And then I realized that the broiler heated up more , even though my oven thermometer had just decided to stop working so I couldn’t figure out what temperature it was at, but at least I knew from my digital meat thermometer that it was hotter than the maximum measurement the digital thermometer could go to which is 400°F. So I decided to wing it with the broiler, and this is the result. 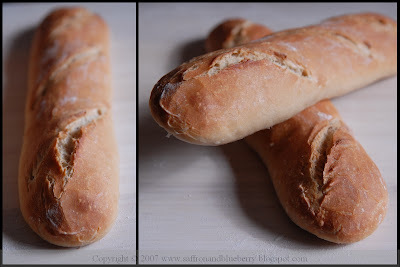 I dumped water in the bottom of the broiler and brushed the bread like the recipe said to, and hoped for the best. LAUREN (trying to sound sincere): What an exciting story! And here you are, they look ok.
HILDA: They turned out ok I think, they didn’t really develop the big air bubbles they were supposed to and they were a little dense, but then again once I’d shaped them they didn’t really rise to three times their size either before I baked them. I think when I was running around measuring oven temperatures and looking for a solution to my oven issue, I left them to rise too long before shaping them. I don’t know, it’s all a mystery really. They’re a little too yeasty and salty tasting but that’s probably because I did something wrong, but I’m just glad I tried to do it anyway, in the spirit of being a Daring Baker. LAUREN (totally insincere now): We’re so happy you did too! Another Daring Baker here at the ceremony tonight! HILDA: Yeah, I recommend looking for our co-hosts Breadchick Mary of the blog The Sour Dough and Sara of the blog I like to Cook because I’m sure their bread is brilliant, but you should also really look around at all the other Daring Bakers here tonight because everyone who participates does a fabulous job. LAUREN: Thank you for your time Hilda! Enjoy the Ceremony tonight! Turns to the camera: When we come back, we’ll be taking a look at our instant and rapid rise yeast nominees and interviewing some bakers with very unusually shaped bread this evening. All that and more when we return to the February 2008 Daring Bakers' Challenge! Stay tuned!